This article is about Malcolm X Boulevard in Manhattan. 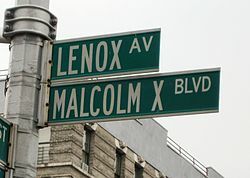 For Malcolm X Boulevard in Brooklyn, see Utica Avenue. For Malcolm X Avenue in Washington, DC, see Congress Heights. Originally a part of Sixth Avenue, it was renamed in late 1887 for philanthropist James Lenox. In 1987, it was co-named Malcolm X Boulevard, in honor of the slain civil rights leader. The avenue was the heart of Harlem during the Harlem Renaissance in the 1930s. The street brought together African Americans, Latinos, British West Indians, and Spaniards who developed relationships over common interests such as jazz and food. In 1932, Harlem was so firmly established as the world capital of jazz and African-American culture in general that "black cinema" films like Harlem Is Heaven were playing on the nation's big screens. Jazz flourished and grew like it could have in no other time and place. "You might have had 15 great clubs on one block, all going at once," said the trombonist and bandleader Wycliffe Gordon. "Imagine going into a joint to check out Willie 'The Lion' Smith, and sitting next to you are Duke Ellington and James P. Johnson." Lenox Avenue is thought by some to be one of the most important streets in the world for African American culture. The Savoy Ballroom was located between 140th and 141st Streets on Lenox Avenue. Other historical venues of Lenox Avenue are Sylvia's Restaurant, located between 126th and 127th; and the Lenox Lounge, located between 124th and 125th. The corner of Lenox Avenue and 125th Street is mentioned in the song "When the Revolution Comes" by The Last Poets on their self-titled album (1970). Small Talk at 125th and Lenox (1970) is an album by Gil Scott-Heron. Lenox Avenue Breakdown is an album by jazz alto saxophonist Arthur Blythe. Columbia Records released the album in 1979. In The Fire Next Time, James Baldwin refers to Lenox Avenue simply as "The Avenue". The main characters of the 1992 novel Jazz by Toni Morrison live at Lenox Avenue. The video for Madonna's 1994 single "Secret" was shot on Lenox Avenue. "Lenox Avenue: Midnight", a well-known poem by Langston Hughes, is set on Lenox Avenue, as is his "The Weary Blues". The avenue is mentioned in his "Juke Box Love Song" and "Consider Me". The avenue is featured in the first verse of the original Irving Berlin lyrics of "Puttin' On the Ritz". The song refers to the then-popular fad of poor but flashily dressed black Harlemites parading up and down Lenox Avenue, "Spending ev'ry dime / For a wonderful time". In the title track of his debut record Lifestylez ov da Poor & Dangerous, Big L raps about 139th Street and Lenox Avenue. There is a web series on YouTube called Lenox Avenue starring Al Thompson, who also created and produced the series. The street signs are heavily featured in the opening titles of the 2016 Netflix series Luke Cage, which takes place and was filmed in Harlem. 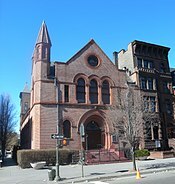 Wikimedia Commons has media related to Lenox Avenue. ^ Google (September 13, 2015). "Lenox Avenue / Malcolm X Boulevard" (Map). Google Maps. Google. Retrieved September 13, 2015. ^ "Governor Announces $11 Million to Enhance NYC Communities (Bronx, Brooklyn, Kings, New York & Queens Counties)" (Press release). New York State Department of Transportation. April 6, 2000. Retrieved May 25, 2007. ^ Gray, Christopher. 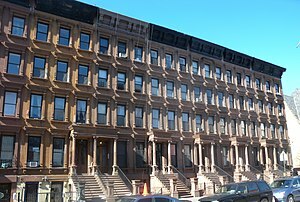 "Streetscapes/200-218 Malcolm X Boulevard, From 120th to 121st Street; A Once-Noble Row of Houses Hopes for Renewal", The New York Times, June 15, 2003. Accessed May 25, 2007. ^ Malcolm X Boulevard Archived 2007-06-09 at the Wayback Machine, New York City Department of City Planning. Accessed May 25, 2007. ^ Friedwald, Will. The Wall Street Journal (New York), 9 May 2011. ^ Aberjhani; Sandra L. West (2003). Encyclopedia of the Harlem Renaissance. Infobase Publishing. ^ Geoffrey C. Ward and Ken Burns (2000). Jazz: A History of America's Music. Alfred A. Knopf. p. 174. This page was last edited on 5 December 2018, at 14:12 (UTC).